He was called OGUSANO Takayoshi and served UNNO Munetsuna but was defeated by the allied force of TAKEDA Nobutora and MURAKAMI Yoshikiyo. He then served the Sanada clan, branch family of the Unno clan and used artifice to help Sanada Yukitaka when he attacked Yoshikiyo. Later he served Unno Nobuchika, second son of TAKEDA Harunobu. 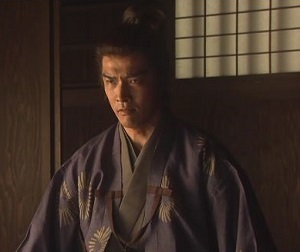 In this series, he uses artifice to reveal a spy in the clan with his younger brother Sōzaemon. 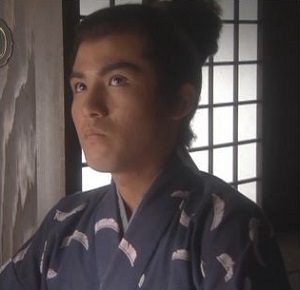 He was a younger brother of Oguisano Takayoshi and served Unno Munetsuna like his brother. 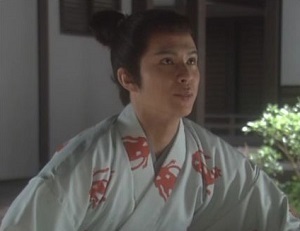 He also served Sanada Yukitaka and played an important role in attacking Murakami Yoshikiyo also. In this series, he attempts to reveal a spy with Wakasanokami taking orders of Yukitaka and deceives Yoshikiyo. He also tells Yukitaka that his wife Shinome and heir Nobutsuna give their attendant(s) the slip. Then they visits YOKUDA Takanaga to persuade him. He serves Murakami Yoshikiyo at first but betrayed him and served Takeda Harunobu whom he opposed. He was succeeded by his son Nobumasa who served UESUGI Kagekatsu. But Nobumasa was killed on suspicion of betraying him. In this series, he orders YAZAKI Jūgorō to make his daughter Hisa become his concubine. However Jūgorō refuses it and it makes him angry and is hard on him and his son-in-law Heizō. 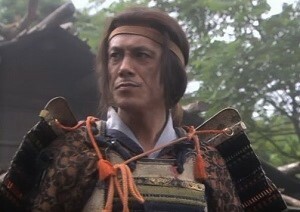 Later he is persuaded by Sanada Yukitaka and Tokida Takanaga and serves the Takeda clan. And this is the last entry regarding "Fūrin Kazan" though I continue posting the entries about Sengoku Period. He was a priest of Shingon sect of Buddhism and the chief priest of Muryō Kōin of Kongōbu-ji Temple, Mt. Koya. 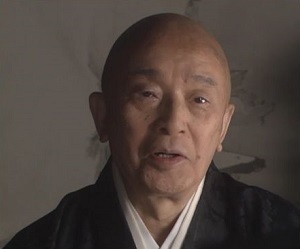 He was acquainted with UESUGI Kenshin (NAGAO Kagetora) and granted him the title of Ajari Gon Daisōzu, one of the thigh-ranking titles of Buddhist monk. In this series, He stops and scolds Kansuke and Kagetora who cross swords in the sacred mountain and preaches the importance of harmony. He was born between SUWA Yorishige and Nene, sister of TAKEDA Harunobu and was called Toraōmaru. But his parents died early and Harunobu had a heir, he became a monk in his childhood and then was killed or escaped to Echigo later. In this series, he is incited to kill Shingen (Harunobu) by Jukeini but is found out and finally kills Hagino, maid of Sanjō Fujin. He is imprisoned but escaped and is killed on his way to Suruga. She is a fictional figure and a maid of O-Goto hime. When she accompanies her to Kai, she sees Kansuke and that it's the order of Harunobu. Then he learns that Harunobu has a new concubine and thinks her existence will threaten Yu-u hime. He decides to kill O-Goto hime but she is a cheerful woman to his surprise. However she worries about her mistress and treats him morosely. he was the 105th emperor and ascended to throne in 1526. As his region was troublesome and the Imperial Court was destitute. So he sold his own handwriting to get money. Some daimyos donated large amount of money to the court but their real intentions were being granted high-ranking titles. 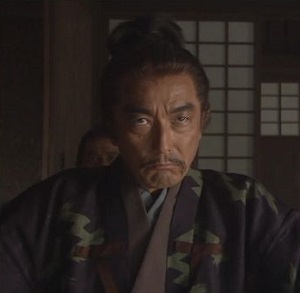 However NAGAO Kagetora pledges his loyalty to him. 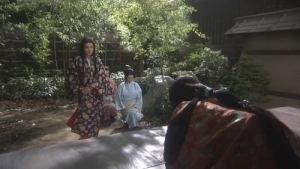 In this series, Kagetora visits the Imperial court and is given Imperial sanction and is permitted to attack the Takeda clan. He was a heir of Imagawa Yoshimoto. After the death of his father at the Battle of Okehazama, he tried to check local rulers who became to betray him and attempted to serve other daimyos. 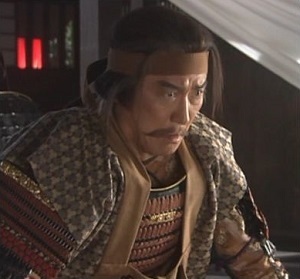 However he was attacked by TAKEDA Shingen in 1568 and then he had a fugitive life for a while. 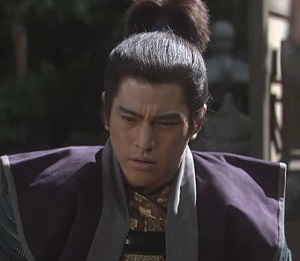 In this series, Yoshimoto and Jukeini put pressure on him and Yoshimoto thinks he will be glad if MATSUDAIRA Motoyasu (later TOKUGAWA Ieyasu) who stays with him as hostage were his son, not him. He was a vassal of Takeda Shingen and accompanied him to the invasion into Suruga. After the death of Shingen, he served his heir Katsuyori but the Takeda Army was defeated at the Battle of Nagashino. After that, his castle was surrounded by the army of ODA Nobutada, son of Nobunaga. He finally was executed in November 1575. In this series, he looks after young Katsuyori and instructs him in swordsmanship. 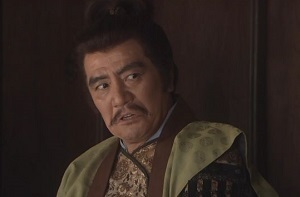 (*) He is a father of ICHIKAWA Kamejirō who acts Takeda Harunobu in this series. He was the lord of Kuragano Castle and a vassal of UESUGI Norimasa. 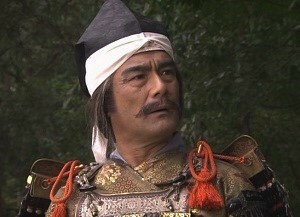 After the fall of Norimasa, he served NAGAO Kagetora, later UESUGI Masatora (Kenshin). However, his castle was attacked by TAKEDA Shingen and fell in 1565 (or 1564). Then he was hid by Masatora and attempted to recapture his castle but ended in vain. 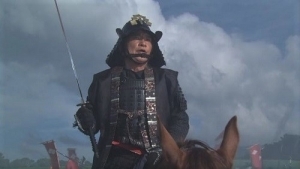 Then he served NAOE Kanetsugu, SAKAI Tadakatsu and then UESUGI Sadakatsu, grandson of Masatora. In this series, he is a superior vassal of Norimasa and accompanies him to Echigo. He is also a vassal of Uesugi Norimasa and stayed in Kōzuke with Tatsuwakamaru, heir of Norimasa after he left to Echigo. But he planned to hand Tatsuwakamaru over to HŌJŌ Ujiyasu who opposes the Uesugi clan to secure the safety of his family. Ujimasa kills Tatsuwakamaru but blames for the disloyalty and executes him also. In this series, he hands Tatsuwakamaru over to Ujiyasu. After killing him, Ujiyasu arrests him and his followers and beheads all of them. His real name was YASHIRO Masakuni and ruled an area (**) of Hanishina County, Shinano. At first he served MURAKAMI Yoshikiyo but betrayed him and served TAKEDA Harunobu (Shingen). After the fall of the Takeda clan, he served ODA Nobunaga and became a vassal of MORI Nagayoshi. In this series, he is the lord of Arato Castle and takes the side of Harunobu when he subdues Murakami Yoshikiyo. 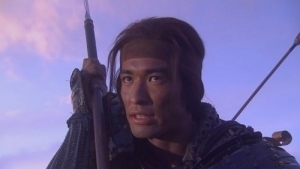 (*) Tanaka was also a voice actor and performs voice-over for Ioan Gruffudd as Horatio Hornblower in the series of "Hornblower" when it's broadcast in Japan. In the series, Kazunaga Tsuji who acts the role of Katsunuma Nobutomo performs voice-over for Robert Lindsay as Sir Edward Pellew. Regrettably, Tanaka died in 2011. (**) The area called Yashiro-gō. He was a younger brother of TAKEDA Nobutora and an uncle of Takeda Harunobu (Shingen). 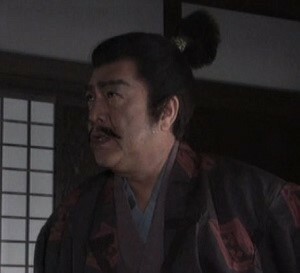 He was trusted by Nobutora well and was based on Katsunuma (*) to keep watch over the Oyamada clan, ruler of Gunnai (**). 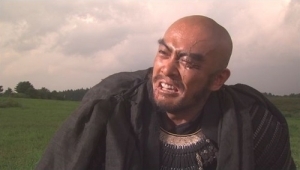 In this series, he supports Nobutora and dies in the Battle of Yamanaka, a battle between the Takeda clan and the Hōjō clan fought near Lake Yamanaka. 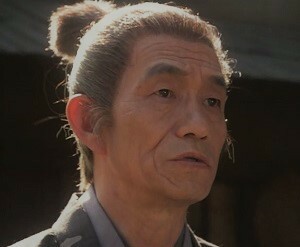 His real name was NANBU Munehide and served the Takeda clan. He is said to have committed suicide after beaten in a Battle against the Anayama Clan. According to "Kōyō Gunkan", a record of the military exploits and strategy of the Takeda clan, he was exiled because of his dubious morals. 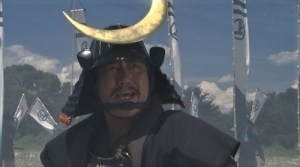 In this series, he disguises as foot soldier of the Imagawa clan and tries to assault Mitsu repeatedly but is killed and beheaded by Kansuke. He is an adopted father of Kansuke. In this series, He adopts Yamamoto Kansuke who refuses to become a monk. But he and his wife Kikuyo have a son called Kanbei while Kansuke travels over the provinces to learn strategy and makes his real son Kanbei take the credit for killing and beheading Akabe Shimotsukenokami. It disappoints Kansuke and he dissolves the adoptive relationship. After that, he uses his original family name Yamamoto. (*) Current Katsunuma in Kōshyū City. The town is famous for vineyards and wineries. (**) The area locates in eastern part of the province of Kai, current Yamanashi. It was originally ruled by the Oyamada clan but was annexed by the Takeda clan later. O-Fuku is a fictional figure. 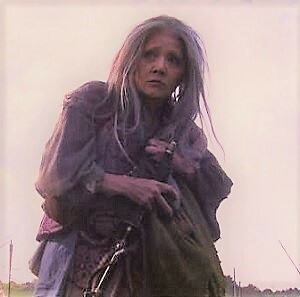 She is a mysterious old woman who lives near kawanakajima and takes care of HARA Toratane who is wounded. When Kansuke learns that he is alive and visits her house, she cooks strange soup and there are various medicines for folk remedy. Kansuke asks her about the weather of Kawanakajima then she makes a touch for it. She does the same thing to USAMI Sadamitsu, vassal of UESUGI Masatora (Kenshin). After the Fourth Battle of Kawanakajima, she removes armours and swords from dead soldiers to earn money by selling them. Then she sees Heizō who walks to Echigo where his wife Hisa and two children, Jūgorō and Mitsu live. She is described as a farmer and a woman who lives powerfully in Sengoku period. At that moment, NAOE Sanetsuna makes his horse run and approaches Kansuke. 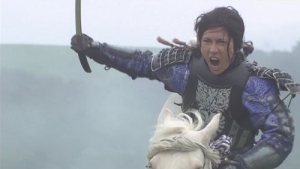 Kansuke who tries to kill Masatora takes a toss and his helmet falls off from his head. He still keeps on fighting despite being covered all over with wounds. He also sees Masatora on white horse far away and he cannot approach him any more. Though he tries to approach him, he makes his horse run to the headquarter. A soldier of the Uesugi Army watches for a chance of killing him. It is Heizō. Kansuke recognises him and tries to hand his Malici to him saying kill and behead himself. However Heizō is shot by an arrow and falls down. Though he loses his eye-patch but he can see the flag of Sun Tzu's words clearly. He remembers that he told Shigen, who was called Harunobu then to control both the Sea of Japan and the pacific ocean. Kansuke who still sticks to fighting sees the flags of six coins then. The detached force includes the troop of SANADA Yukitaka arrives at Hachimanpara. "My Lord, you win the battle." Immediately after the arrival of the force, some enemy soldiers approach him saying "The time has come to die". And they kill and behead him. Meanwhile, O-Kuma searches for the disapperaed Malici of Ritsu. Then Ritsu comes home with some eggplants and finds her Malici goes onto a verandah somehow. She realises something happened to Kansuke and weeps. At last the situation is advantageous to Masatora in the morning but the Takeda Army controls it in the afternoon though the battle is not settled. Besides many soldiers of both armies die or are wounded. At Masatora's headquarter in Zenkōji Temple, he says that the heads they took will be identified at Mt. Motodori. Sanetsuna tells him that it's their win but he says the war will continue and this troublesome time is just like one night dream. 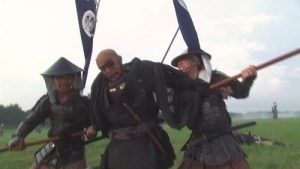 Against their expectations, the heads of Nobishige and Torasada are taken back to Shingen's headquarter. He sheds tears ovdr the death of Nobushige who agreed with his idea and appreciated him when he decided to exile his father Nobutora. At that moment, KOMAI Masatake finds somebody who runs to them from far away. It is Denbée who carries the headless body of Kansuke on his back. And Takichi returns to them with his head. He swears that the head is that of Kansuke himself. BABA Nobuharu who hears his words says there is no doubt because his face is so characteristic. Takichi joins his head with smile and his body together. Then Shingen and his vassals give a shout of victory. Around 4 p.m., Shingen and his army retreat Hachimanpara and in Echigo, Hisa prepares meals and separates that for Heizō from theirs. At the same time, Heizō walks leaning on a spear and mutters to himself that he wants no more war and hopes to return to Echigo early. In the battlefield, may farmers who remove the armours , swords and spears of dead soldiers to sell them. O-Fuku is included in them and sees Heizō walking hopelessly. He walks so slowly and seems to take time to arrive in Echigo but he heads for his home saying he will not die. After that, OBU Toramasa was involved in a rebellion and committed hara-kiri and Yoshinobu was disinherited in 1565. Shingen shut him up in Tōkōji Temple and he died in 1567. In 1570, his mother Sanjō Fujin died of illness. 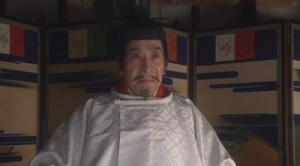 In 1573, Shingen died at the age of 53 and his death was kept secret for three years. His heir Katsuyori fought against the allied force of ODA Nobunaga and TOKUGAWA Ieyasu and was defeated at the Battle of Nagashino in 1575. Baba Nobuharu and YAMAGATA Masakage (Obu Masakage) fell in the battle. 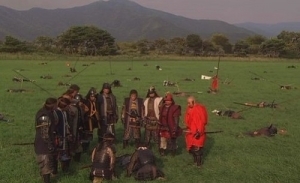 And in 1582, Katsuyori was cornered by Nobunaga and committes suicide after the Battle of Tenmokuzan and the Takeda clan as Sengoku daimyo was destroyed but the family line survived. O-Kuma is a fictional figure and a wife of Takichi. They are farmers who live in Kuzukasa Village of Kai at first. She has seven children between Takichi though two of them die early. When YAMAMOTO Kansuke serves TAKEDA Harunobu, they become his servants and live with him. But in actual, they are practically the members of his family (*). She works as housekeeper and makes her daughters with the housework but takes a nap when she is alone. When Kansuke adopts Ritsu, she disputes with her but later makes it up with her. On the day of the Fourth Battle at Kawanakajima, she finds the Malici that Ritsu is given from Kansuke is not in the altar. Then Ritsu finds it is on the verandah somehow and then she realises what happened to Kansuke. 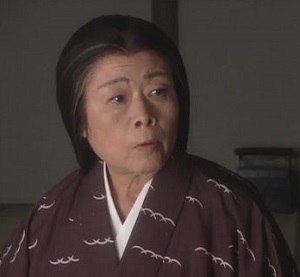 (*) In the episode 13, she secretly feeds her youngest son Yokichi while Kansuke dines. She is scolded by Takichi but Kansuke realises their children cannot eat anything until he finishes his dinner. So he tells them to dine together and they are delighted with his words. SANADA Nobutsuna was a heir of Sanada Yukitaka and an uncle of Sanada Nobuyuki and Nobushige (Yukimura). Like his father, he served the Takeda clan and participated in the Fourth Battle of Kawanakajima and invaded Suruga and Kōzuke. He seemed to have succeeded Yukitaka informally at the end of the 1560s. He usually participated in battles not only with Yukitaka but his younger brother Masateru. He was famous for his bravery and intensely fought against the allied forces of ODA Nobunaga and TOKUGAWA Ieyasu at the Battle of Nagashino in 1575. But he was counterattacked by the musket troop and died at the age of 39 and Masateru died in the battle also. After that, their younger brother Masayuki, who was called MUTŌ Kihei was ordered to succeed the Sanada clan by Takeda Katsuyori (*). 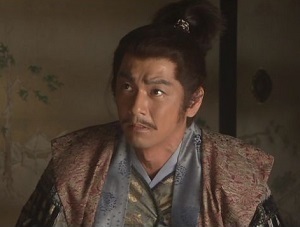 He had four children and one of them is Sei-in-in, wife of Sanada Nobuyuki and later becomes his concubine. In this series, he is described as a courageous young man who instructs his younger brothers in swordsmanship. He accompanies his mother Shinome who visits TOKIDA Takanaga to persuade him to take the side of Yukitaka. According to "Kitsutsuki Senpō" （Operation Woodpecker), TAKEDA Shingen sends detached forces to Mt. Saijo where UESUGI Masatora is based to attack his army and make it climb down the mountain to a plain called Hachimanpara. Howevder the army has already climbed down and Masatora adopts a formation called Kurumagakari-no-jin, that is disadvantageous to the Takeda Army. Both Nobushige and MOROZUMI Torasada attack their enemy to gain time and are killed. Kansuke accepts his failure and remembers that Ōi-Fujin told him that he is a sad man by nature because he said if Buddha appears now, he will take up arms also. "Not only protect, but win also." Kansuke decides to go to the front also and asks Yoshinobu to be with Shingen and KOMAI Masatake to protect them. At that time Sanjō Fujin visits O-Goto hime and she hopes to be flown by the wind like a cloud and says both Shingen and Kansuke thinks it's their duty to raise the winds. "I release the world from the bad dreams of invasion!" At that time, Momo hime and her son Unomatsu prays for his win. And Kansuke is informed by a Mukade Shu the advance of Masatora's soldiers advance so he orders him to tell it to Shingen. Then he makes Denbée and Takichi command soldiers and intends to invade a place. Then Yoshinobu approaches him and says it's him who invades a place. 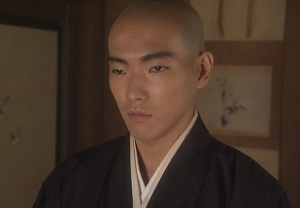 Kansuke admonishes him that he is an heir of Harunobu and his life is more important for the Takeda clan than his own. So Yoshinobu returns to the headquarter and Kansuke asks him to take care of Katsuyori (*). He remembers the words of AMARI Torayasu, "You should know what you gain and what you lose" and those of ITAGAKI Nobukata, "Be a real strategist and support Harunobu (Shingen)". 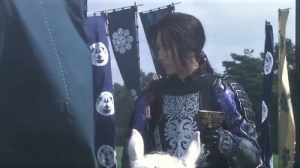 When he is about to run his horse, something that seems to be an illusion of Yu-u hime stops him and he realises that she tries to stop him not Katsuyori. He shouts he is still alive and never die until Shingen governs Japan. The troop of SANADA Yukitaka climbs down Mt. 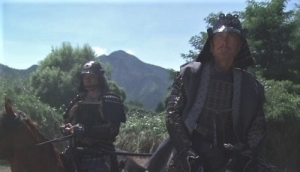 Saijo and comes near Chikuma River but Yukitaka sees the troop of MURAKAMI Yoshikiyo on the other side. Then they fight each other in the river. And at Hachimanpara, Sadamitsu tells Masatora's vassals to protect the headquarter and orders Kansuke who fights bravely near the headquarter to return. "For what do you fight? You go so far as to destroy our province! " At that moment, Masatora runs his horse to the headquarter of Harunobu. The action surprise the soldiers and both Sadamitsu and Kansuke make way for him unexpectedly. Immediately after, Kansuke chases him. Masatora attacks Shingen who is alone at his headquarter and tries to slash at him. But Shingen keeps calm and stops the blows from his sword with gunbai (fan). As the soldiers return and one of them spears Masatora's horse, he returns to his headquarter. Shingen shows them his fan and says that he stop three blows but there are seven scars on his fan and says Masatora really is the Dragon of Echigo (**). And Kansuke still fights near his enemy's headquarter and the words of Sadamitsu crosses his mind. Kansuke answers him that he fights for whom he loves in the spirit. (*) Prpbably he decides to die in the battle. 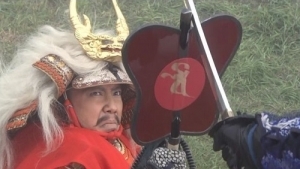 (**) This is a well-known episode in the Fourth Battle of Kawanakajima. 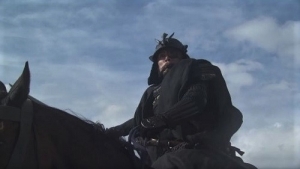 The images are form the DVD series of "Fūrin Kazan".